The Job You've Always Wanted! opportunity that you've been looking for. Just sign in and we'll see you on the other side! Sign in to view your On-Demand Videos NOW! Cleon, Just managing my Linkedin connections to try and keep my network current and alive. Saw your name and looked at your profile. You are missing one key specialty. That of Teacher. A couple of days ago I wrote to a former colleague who is just now involuntarily facing the end of his long career and is going through the early stages of the prospect of a job search. I tried to write him some pearls of wisdom, along with some real suggestions. In the dialogue, I introduced you, and referenced you several more times, all in relation to “what Cleon taught us,” or “what I learned from Cleon,” etc. It is what you do, even if you don’t really think of it that way. I took away many lessons that I will never forget, and for which I am very grateful. I have been at my job nearly 3 months now. I am finally beginning to see areas where I am in control of the job instead of the job being in control of me. It has been a lot of work to get to that point. I can’t tell you how many times I have thought of that old adage about old dogs and new tricks. But I am learning, it just seems as though the process is taking longer than it used to. I also found that going to a completely different business within the same company was less like coming home than I thought it would be. It really does feel very much like I am working for someone completely new and different. But it is a good job and I am very lucky to have it. Cleon ~ I am Pam Jones ~ Chuck Jones' back seat rider in life. The road in our lives has often been bumpy, and it appears the older we get -- the road almost appears treacherous at times. Therefore, I just had to tell you how grateful we are for your dedication to the Jobfinderssupport Rest Stop. What a haven of a place for all riders. Thank you so much for your support, advice and encouragement. PS. YOUR BOOK IS EXCELLENT. REALLY HITS HOME! 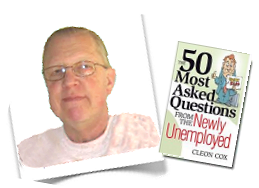 The Job Finders web site provides unemployment support services for job hunters and the newly unemployed. 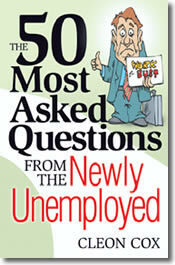 You can also purchase Cleon Cox's new book, "The 50 Most Asked Questions from the Newly Unemployed". Support Group - Learn about the Portland, Oregon metro area Job Finders Support Group. Start a Group - Are you looking for job support in your area? We can help you start your group. Helpful Resources - Books, links, tips and opportunities to share your stories and questions. Founder - Job Finders Support Group started in 1991. Learn more about this dedicated organization. Longer than usual yet an excellent read and mind opener.